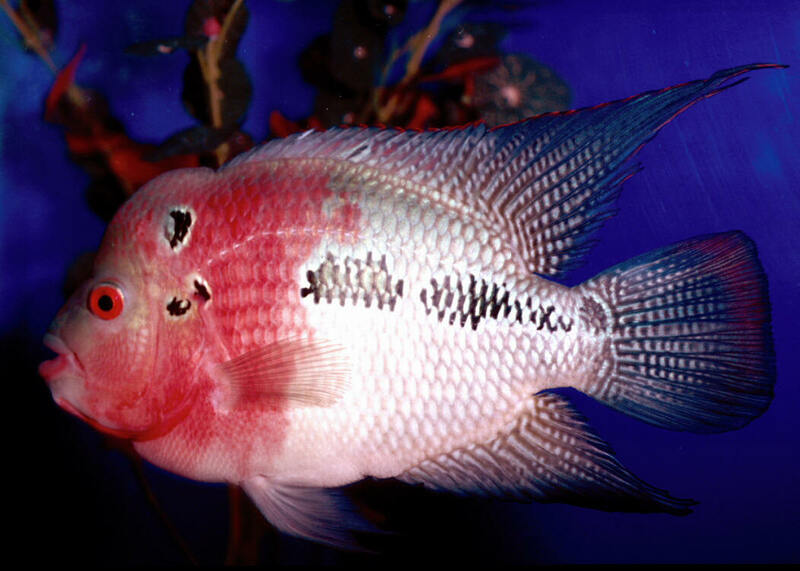 Mesonauta festivus (Heckel 1840), the Flag Cichlid. South America; Orinoco to Paraguay. To six inches in length. An old standard in the more peaceful medium sized cichlids in the aquarium interest. A dihybrid "new cichlid" out of the Far East... this pic shot a month back at the Aquarama show in Singapore (mid 90's)... is likely (my guess) a Vieja (formerly Cichlasoma) maculicauda (Black Belt) and Cichlasoma trimaculatum cichlid cross... a beauty, but still a cross.